Before your removal can commence, the lorry must be placed as near as possible to the house. If you live in a narrow, restricted or busy street please contact the local Police and Parking Authority if a dispensation is required. You will usually find them very helpful. The team leader will introduce himself and his crew to you. Show the team leader around the house and point out anything that you are worried about. The crews are friendly and helpful men who are trained porters with considerable experience. They will be delighted to hear good advice but you will not need to stand over them to ensure they are being careful. They will not mind if you want to help out with the smaller things, but please remember that they are ultimately responsible for the safe delivery of your possessions. Moving furniture is heavy work requiring continuous mental and physical effort so the odd tea break goes down well and keeps everyone refreshed. Ensure that anything you need for your journey is kept safe. Items to consider are passports, paperwork, keys, bedding, clothing, food, tickets and children’s toys. Once the vehicle is loaded, walk around the house with the team leader, check inside wardrobes, behind doors, in the loft, airing cupboard, kitchen cupboards and drawers, and don’t forget the shed and garage. It is ultimately you responsibility to make sure everything is taken. Upon delivery it is important that someone is on hand so that the crew can be told where to place each item of furniture. Labelling boxes saves time. It is a good idea to have a set room for boxes that do not need to be unpacked straight away to avoid clutter in the main rooms. For example you may not want 20 boxes placed in the kitchen because you may have to move them again before you can open a cupboard to put anything away. Any furniture dismantled by us will be re-erected. On completion the lorry will be swept out and the blankets folded. 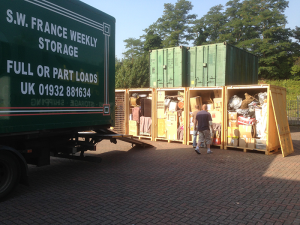 Whilst this is being done, check that everything is where you want it and the lorry is empty. If you want to change the position of certain items of furniture, just ask. 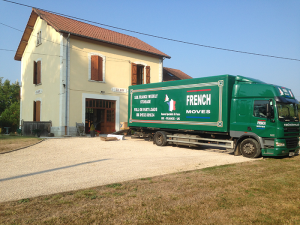 We can supply storage for your belongings in both England and France, we have storage facilities in Weybridge, England and in France, the warehouse is in Villeneuve Sur Lot, in the Bordeaux region. 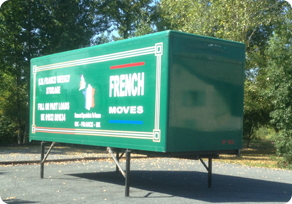 As a guide, it is normally cheaper to store in France. However, when deciding where to store, please bear in mind that the major cost of a move abroad is the transportation cost. For example if you are moving to rented, furnished accommodation in France whilst you are looking for your dream home, it may make sense to store in England in case things don’t work out as expected. Quite often, we are asked if we can store the furniture for a few days in between collection and delivery. We can normally do this without adding to the cost because the trucks have demountable bodies (as shown on the home page) we can simply, drive the truck in to the warehouse, put the legs down on the body and drive the truck out from underneath then pick up an empty body. The truck can then carry on working and nothing needs to be unloaded or reloaded. This can be carried out by one person in less than five minutes. We can store most things except flammable or perishable goods. Each customers belongings are stored in separate, sealed containers. If you require access to your belongings once they are in storage, please be aware that only accompanied visits may be made to the storage facilities and there will be a charge for this service.